Bali Jatiluwih and Tanah Lot Sunset Tour is one of the best Bali Full Day Tour Packages in Bali islands to visit Jatiluwih Rice Terrace the beautiful panorama of rice terrace unfolding from the foot of mountain and then continue to see the fascinating view of sunset at Tanah Lot Temple. Is great opportunity we offer to see the beautiful rice terrace and enjoy the view of sunset at Tanah Lot Temple or most known as Sea Temple. Bali Jatiluwih and Tanah Lot Sunset Tour will visit places of interest such as Taman Ayun Temple is beautiful temple in Mengwi regency, then visit Bali Coffee Plantation to see the various coffee plants and try the testing coffee for free, After visit coffee farm we continue to visit Bedugul area to see the remarkable view of Beratan lake temple / Ulun Danu Beratan Temple. 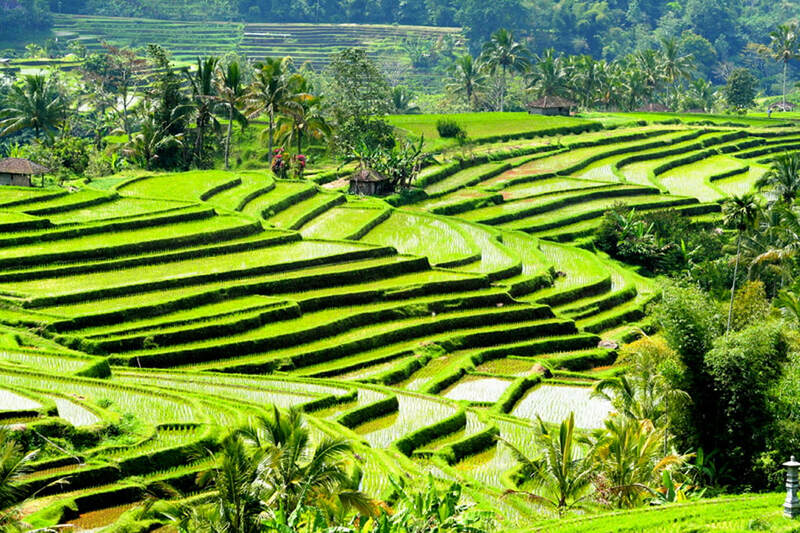 Then we directly to visit the Jatiluwih Rice Terrace with breathtaking view of rice paddy, this rice terrace is the biggest rice paddy in Bali, then we will having lunch in this site, while having lunch you can see the view of rice paddy. After lunch finish, the trip continue to visit the highlight site in this tour packages, we will visit the Tanah Lot Temple is a Balinese Hindu temple on the rock located in the middle of sea, this temple is the most visit during sunset time, due the view was unbelievable was amazing, is great moment you don’t want to missed. The Jatiluwih and Tanah Lot Sunset Tour will explore Bali nature with beautiful panorama and local society life. Enjoy this Bali Jatiluwih and Tanah Lot Sunset Tour packages with our Balinese Tours Driver during your holiday in Bali and below is a short description about the place of interest you will visit during Bali Jatiluwih Rice Terrace and Tanah Lot Temple Sunset Tour. Bali Coffee Plantation is place where you can witness the various of plantation such as coffee arabica, coffee robusta, pineapple, balinesse snake fruit, and etc. experience to see how to make Balinesse coffee, try the best of balinesse coffee or ginger tea with green view river valley. They sell variety of theirs original Balinese coffee products, herb oil and etc and see the civet cat the most expensive coffee maker, wellknown as Luwak, its produce "Coffee Luwak" and the process of the bean passing through the digestive tract of the civet chemically alters the proteins in the Luwak coffee bean to yield more complex and smooth flavors, not found in conventional coffees.